Dataclysm by Christian Rudder. Broadway Books; 2015. 304 pages. Paperback/Softcover. 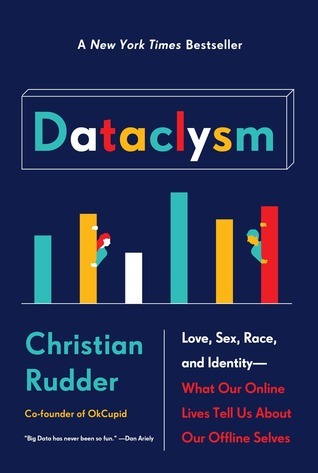 Dataclysm is a social snapshot of society drawing on data from Facebook, Twitter, and OkCupid, a popular dating site created by the author, Christian Rudder. This book explores how the things people "like" on Facebook can reveal very specific details about our lives - such as our sexual orientation, - how people describe themselves online versus how they actually act in person, as well as how to deduce the approximate amount of homosexuals live in each state, whether they are open about it or not. The data Rudder draws from a majority of the time is relatively slim, considering most of it is from OkCupid, a dating site. He admits that much of his data will be skewed as a result of this, but it still lends a bigger question of how much we should really take stock in what he says representing everyone versus how much we should just take for purely entertainment's sake. Since OkCupid is a what it is - a dating site - it's obvious that there's going to be a skewed sample of people that are generally single, middle-class, and more likely to be male than female. It's important to realize that this information is largely applicable mainly to the United States, as there are different cultural and societal norms in other countries, and some countries don't have nearly as much access to the internet and social media sites. I do think that Rudder's information lends itself to a bigger picture of how people interact with one another and act online versus how they act in real life. The actual real-world picture may be different from Rudder's limited sample, but it still creates the same overall idea, which is really what I think Rudder is trying to point out. It's very thought-provoking, and I think Rudder brings up some really interesting points through his research. For example, his deductions revealed about attitudes on race and sexuality seem to be rather representative of the United States as a whole, and I feel that this can lead to intriguing discussions on how people change their views or attitudes based upon what is socially acceptable. Rudder's writing is wonderfully engaging. He has a strong sense of humour and wit that makes this novel both enjoyable and easy to read. In fact, I finished it extremely quickly because of this: I would sit down to read, only to look up a while later and realize that an hour had passed and I didn't even realize it. Whether the information presented was enlightening and groundbreaking or not, it's still a highly amusing and interesting book. I did really, really love the graphs, though. I love looking at graphs and statistics, so I had a delightful time looking at all of them, even if they weren't very interesting or necessary to what he was saying. There were a few graphs that didn't really add to the discussion, but they still fit in well enough with what Rudder discussed. The format of the book was interesting. There were large categories that housed chapters within each; I both liked and disliked this method. It was nice to have more brief, to-the-point chapters, but it also felt a bit disjointed and rushed as well. Personally, I feel like each chapter could have been a separate blog post on Rudder's blog, which I had never previously read, but I've heard that the book is basically just a really, really long blog post. So if you like Rudder's blog, you are most likely sure to enjoy this book. I'll be honest, I was expecting more from this book. While Rudder provided a large amount of interesting statistics and insight, I was expecting to learn something much deeper and juicier than what I really learned, which is basically that people aren't what they appear to be on the internet. Overall, I feel as though Dataclysm deserves three-and-a-half stars; it was wonderfully entertaining, but I think it really lacked the overall cohesion or depth that I was really craving.